As one of New Zealand’s largest office product resellers, OfficeMax’s mission is to ‘help customers do their best work’. If the company was to practice what it preached, it knew its own ‘best work’ could only be done with the best facility. 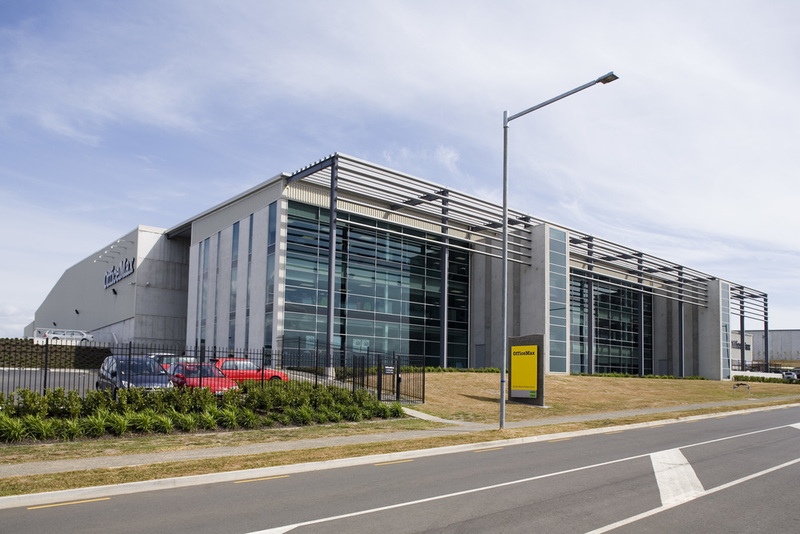 The new OfficeMax building, at Highbrook Business Park in Auckland, brought together two distribution centres and three offices that had previously been separate. The new design not only centralised operations, it also improved the community aspect of the company – a factor recognised as vitally important by the organisation’s senior management team. A clear brief from the client told Ignite that the aim of the project was to unite all staff in one workplace, with one business focus. In response, Ignite created a concept with transparency as the main theme. Open plan offices, shared spaces, a shared cafeteria and breakout zones allow for plenty of face-to-face contact between teams, which reinforces OfficeMax’s community ethos. A literal interpretation of housing ‘everyone under one roof’ resulted in one roof that spans the 15,000sqm distribution centre and the 4,500sqm head office. Large steel portals run the length of the roof, becoming a brise-soleil over the front façade of the building. In conjunction with extensive glazing, this brise-soleil provides shelter from the sun without compromising views of the neighbouring estuary. Within the building, an 8m wide by 50m long ‘central street’ reinforces transparency by serving as an atrium that opens each level out to the central foyer and joins the warehouse and the office block together. 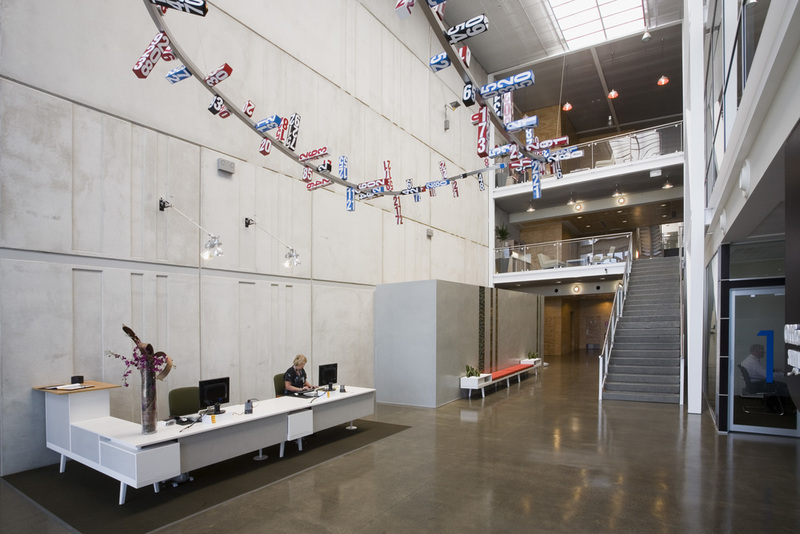 The main wall of the atrium is a precast concrete panel scored with a pattern resembling bar codes. Referencing the way that each OfficeMax product is tracked, the bar code detail serves as a reminder of this vital part of the business that shares the office space. Sitting amongst the precast concrete panel walls and concrete floors is the services core. Panelled in sustainable plywood, the core is a prominent vertical element that balances the overriding horizontal lines of the office floor plates. Recognising the importance of transparency for the client, Ignite created an open environment for the 420 staff that work in the building. Large skylights stream light into the atrium, ensuring there are no dark spaces. Each open plan work floor is clearly visible from the atrium level below and open stairwells further enhance the transparency. The result is a building that supports communal interaction throughout the workplace.